A rare opportunity to purchase a two bedroom characterful apartment situated in the heart of Bruton. 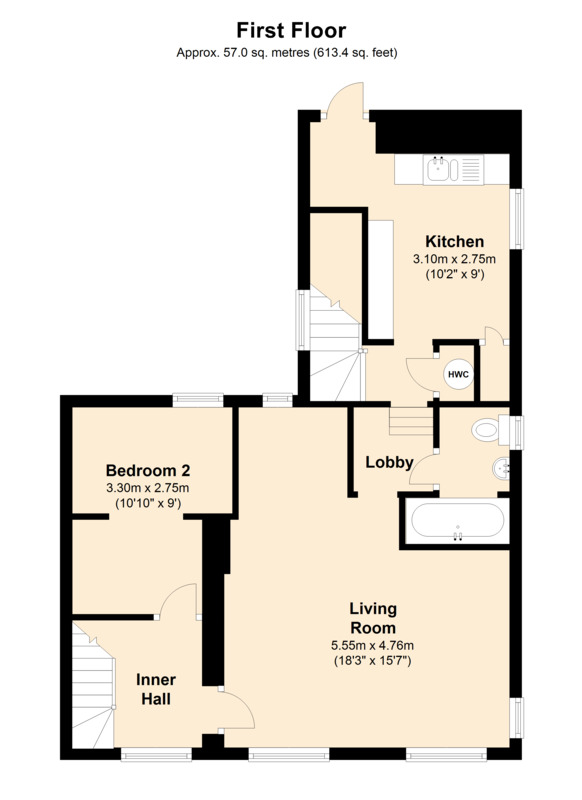 This individual and very charming home enjoys spacious living accommodation arranged on different levels. The sitting room is a particular feature being of a generous size and featuring two gothic style arched sash windows to the front aspect. Other attributes include an attractive cottage style garden, fitted kitchen with solid woodblock working surface, private entrance and gas central heating. LOCATION: Bruton is a small ancient South Somerset town nestling in the foothills of Brue Valley surrounded by unspoilt countryside. The town has retained great charm over the years with many interesting and historical buildings which defines its character. The main industries are agriculture and education with four schools in Bruton. King’s School, founded in 1519, Bruton School for Girls, Sexey’s School and a primary school. Bruton has many thriving groups and societies including a Festival of Arts, Horticultural Show, musical and theatrical productions. It is also now well known by the establishment of the renowned Hauser & Wirth Art Gallery and Mill on the Brue Outdoor Activity Centre. The town has a small range of shops and a range of public houses and restaurants including the award winning ‘At the Chapel’. There are many other charming towns nearby which together offer a wide range of shopping, cultural and sporting activities. These include Castle Cary, Wincanton, Sherborne, Shaftesbury and Wells with Bath, Bristol and Salisbury all being in easy reach. Communications are good with a small rail station in Bruton and mainline services at Castle Cary (Paddington) and Sherborne (Waterloo). The A303 a few miles south is the road link to London and Bristol international airport is well within an hours drive. ENTRANCE HALL: Radiator, laminate wood flooring and stairs to first floor landing. 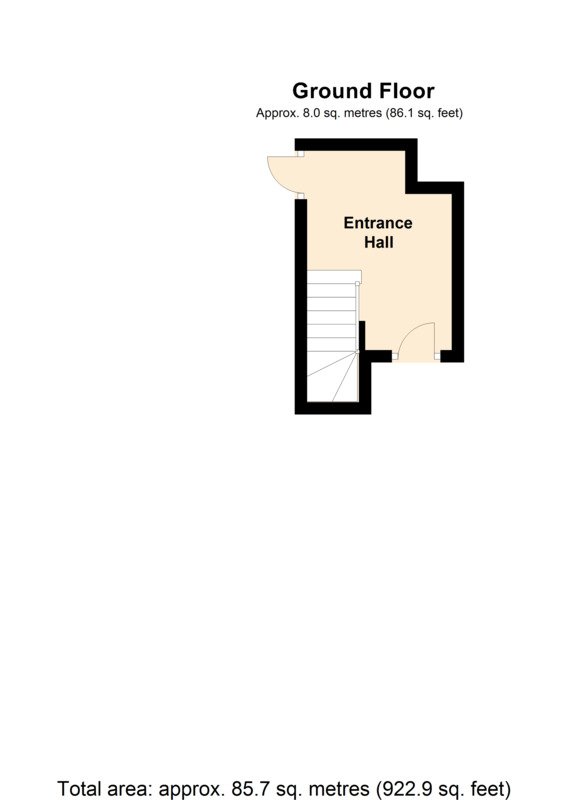 FIRST FLOOR LANDING: Double glazed window to side aspect, built-in storage cupboard, airing cupboard housing hot water tank with shelving for linen and doorways to kitchen and living room. KITCHEN: 10’2” x 9’ (excluding large recess) Inset 1 1/4 bowl single drainer sink unit with cupboard below, further shaker style drawer, base and larder units, woodblock working surface, vertical radiator, space and plumbing for automatic washing machine, cupboard housing Worcester gas boiler supplying domestic hot water and radiators, built-in larder, double glazed window to side aspect, tiled floor, space for range style cooker, exposed timber and stable door to an area of decking which overlooks the garden. LIVING ROOM: 15’7” x 18’3” (narrowing to 10’10”) A characterful light and airy room with feature gothic style arched sash windows to front aspect, slate hearth with tiled backing and flu for wood burning stove, double glazed window to side aspect, three radiators, laminate wood flooring, display recess, exposed ceiling timber and double glazed window to rear aspect. BATHROOM: Bath with mixer taps and shower attachment, pedestal wash hand basin, low level WC, heated towel rail, tiled to splash prone areas, double glazed window to side aspect, downlighters and tiled floor. 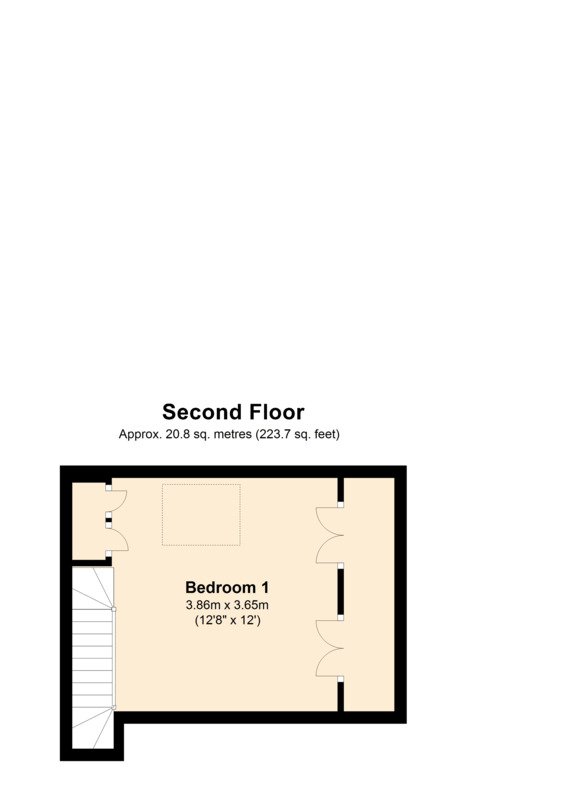 BEDROOM 2: 10’10” x 9’ (narrowing to 7’) Radiator and double glazed window to rear aspect. From the inner hallway stairs to first floor attic bedroom. BEDROOM 1: 12’2” x 12’8” (max) Radiator, velux window to rear aspect, exposed timbers and fitted storage cupboards. A delightful cottage garden with a timber decking terrace overlooking the garden with lawn and paved seating areas bordered by shrubs and enclosed by a natural stone wall. Useful stone outbuilding and steps down to a courtyard with raised flower borders enclosed by a high wall.